﻿﻿"Innovation in a rapidly changing world"
​hosted by the American School of Dubai. This upcoming conference will be held from March 1- March 3 2018 at the school Campus located in Al Barsha, Dubai. Being one of the most cosmopolitan cities in the world, Dubai's culturally diverse demographic yields a vibrancy optimal for passionate debate, collaboration, and leadership. ​Previous ASDMUN conferences hosted delegates from various schools who worked collaboratively to overcome any differences they had in a focused effort to pass resolutions that targeted the world's most pressing problems. Delegates were given the invaluable opportunity to speak out and resolve current crises and turmoils contingent on the use of diplomacy and compromise as practiced in the United Nations. It is my hope that ASDMUN 2018 will follow the successful legacy of the previous conferences, and see delegates who possess the same enthusiasm, passion, and collaborative spirit to make this year’s conference an even greater success. There will be seven forums available for delegate participation: the General Assembly (GA), Human Rights Commission (HRC), Environment Commission (EC), Economic and Social Council (ECOSOC), Security Council (SC), International Court of Justice (ICJ), and Arab Council (AC). The conference will take part over three days of intense, but crucial lobbying, debate, and conflict resolution. The theme of ASDMUN 2018 is “Innovation in a Rapidly Changing World ” it is especially apt for our conference as it emphasizes the need for our society to innovate key strategies and policies in order to sustain ourselves in a modern, rapidly changing society. Innovation can embody itself in many distinct ways that all collectively assemble into one prosperous future, whether that be implementing new rules to sustain the environment, innovation of new technologies to aid migrants, or implementation of frameworks to reduce economic instability within LEDCs. This theme encompasses a wide range of political, economic, social, and ethical issues that the delegates will have the opportunity to debate during the conference in their efforts to strive for a better world. I hope that ASDMUN 2018 will serve as a remarkable simulation for delegates to acquaint themselves with the demanding, challenging, yet eventually rewarding experience that comes from working within this remarkable international system that we call the United Nations. 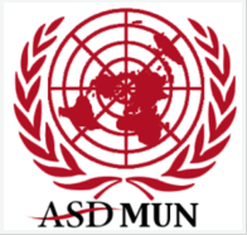 ASDMUN 2018 will truly be an authentic outlet for high school students to seek engagement as positive, active global citizens. While I hope that the delegates will be active participants in forums that stimulate debate, it is also in my sincerest hopes that delegates will leave the conference having truly understood the essence of international relations in society, and a grasp on how the world's issues are settled. Delegates will be able to utilize their freshly sharpened skills in leadership and cooperation to assert themselves not just on the podium, but in everyday life when they are faced with tasks that require organization, confidence, and coordination. I am confident that the delegates will come prepared with knowledge and optimism, and will propose creative solutions as well as pass successful resolutions that address prominent international crises. If you have any questions or concerns, please do not hesitate to contact the ASDMUN Secretariat at asdmun@asdubai.org. I look forward to welcoming you to our campus and conference in the Spring!